There are many ways to preserve fresh herbs and this week I tried them all! As cold weather fast approaches I needed to harvest and preserve all the herbs in my garden quickly before they froze. 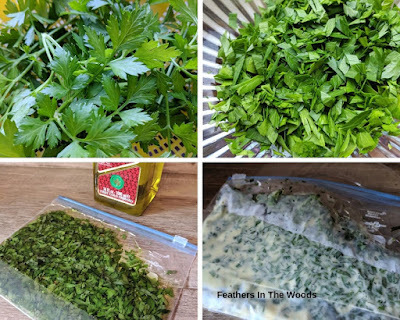 Of course fresh is the best way to use garden herbs, but I'm not willing to go without herbs all winter....so I went on an herb preserving spree. At this point in time it's ok to harvest as much of the herbs as possible! Frost is just around the corner and anything not preserved will be lost after a good freeze, so go ahead and harvest all you want from perennial herbs. Because of the timing, I kinda went crazy. I ended up with baskets and baskets of basil, parsley, sage, mint, lemon balm, chives and more! 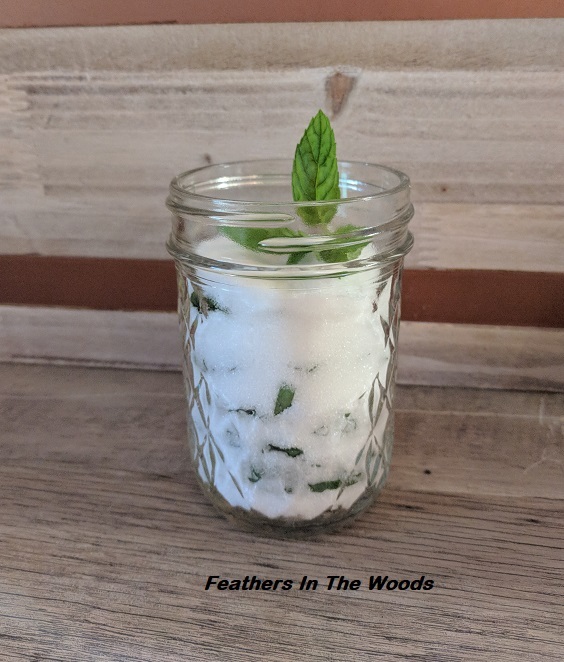 This week alone I froze herbs in oil, made herb vinegars, compound butters, herb salts, dried herbs and made herb flavored sugars with the herbs left in my garden. That is an amazing array of herbs for later use! When deciding how to preserve herbs you'll also need to think about how you like to use the herbs. Oh sure, almost all herbs can be dried and used that way, but there are other preserving methods that will get your more flavor from the finished herb than drying does. It all depends on how you like to cook with the herb in question. For instance, you wouldn't preserve lavender in oil because it's rarely used that way. 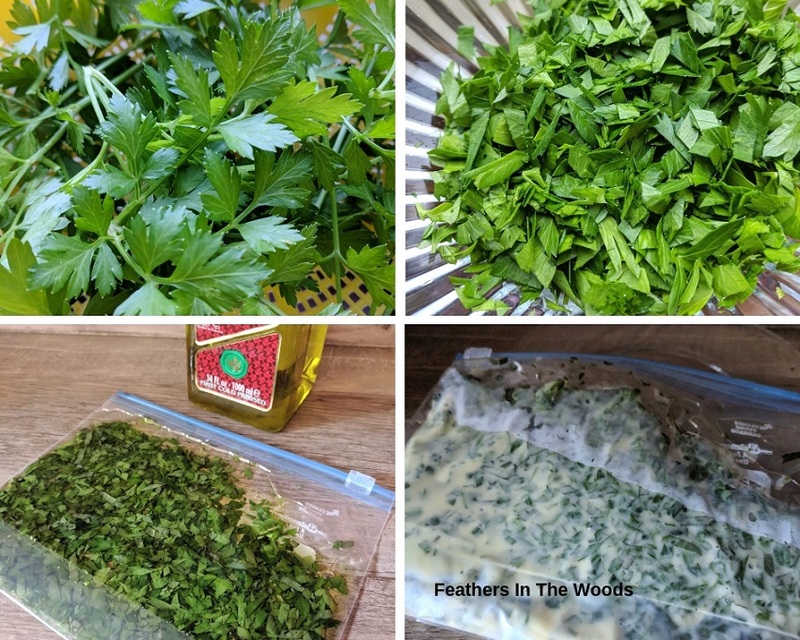 However parsley and oil are often used together in recipes, so that one makes more sense. Lavender can be preserved in sugar to use as an accent on pastries and other sweet treats. I have tried every method for drying herbs over the years and this year I pulled them all out! I hung some flowers to dry in the shed. I used my dehydrator for the sage and chamomile. When that was full I turned to the oven to dry some herbs and even used my super simple solar dehydration method. Finally, I caved in and started using the microwave to dry herbs. I was out of space everywhere else! Layering: You only need 2 ingredients to preserve herbs using salt: herbs and sea salt. I start with clean, dry herbs removed from the stems. Using a large mason jar, place 1/2" of salt in the bottom of the jar. Cover salt with a layer of herbs. Cover herbs with a layer of salt. Cover salt with a layer of herbs and so on. Continue layering until you get to the top of the jar. 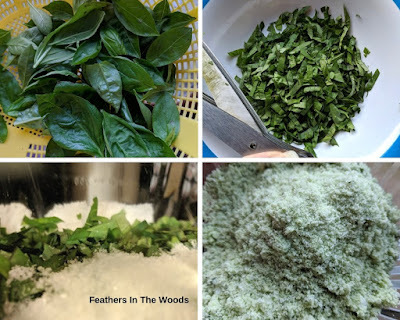 To use just remove a leaf from the salt and chop it up then add to your recipe. These stay surprisingly fresh so they won't crumble to bit's like dried herbs but they taste much fresher so it's worth the extra prep work! I like to chop my herbs before adding them to the salt as the mixing process goes much quicker this way. I use herb scissors but you can chop them with a knife if you prefer. Place salt and herbs in blender and pulse till herbs are finely chopped. You can spread your herb salt onto a baking sheet and allow to dry thoroughly for a few days, or place in an oven on low for about 30 minutes. This time of year the furnace is on so the air inside my house is fairly dry, so I just let mine sit out overnight. Once dry store your herbed salts in a mason jar. Not sure how to use herb finishing salts? Check out this post from SeaSalt.com on How to use flavored salt. When preserving herbs I often use for baking or other sweet treats, I like to use sugar. In this instance I was preserving mint and lemon balm. I use pure cane sugar and layer sugar and herbs in a mason jar exactly as I did above with the salt. I start with clean, dry herbs removed from the stems. Using a large mason jar, place 1/2" of sugar in the bottom of the jar. Cover sugar with a layer of herbs. Cover herbs with a layer of sugar. Cover sugar with a layer of herbs and so on. Continue layering until you get to the top of the jar. When layering, be careful not to overlap the herbs. When using sugar, the places herbs are overlapped will wilt and turn dark. This doesn't happen with salt but you do have to be careful with sugar. To use herbs, pick them out of the mixture and crumble before adding to recipe or steeping for tea. You can use the sugar in recipes also, but keep in mind that it will taste like the herbs so consider flavor combinations when you choose how to use it. Just like we did with the salt, you can also chose to process the herbs and sugar with a blender to make a flavored sugar. This is great in tea or other drinks but you will find tiny pieces of herb floating in your beverage, so if that is off putting use the layer method instead and sift the herbs out before using. If your herb sugar clumps together from moisture, you can pour it onto a baking sheet and allow to air dry overnight like above with the herbed salts. Softened butter can be blended with fresh herbs to create a flavorful spread for bread or topping for steamed vegetables or grilled meats. My favorite to make is chive blossom butter but since the chive blossoms are gone now, I used chopped parsley and chives to make a compound butter this time. In a small mixing bowl mix softened butter with herbs and salt until thoroughly blended. You can scoop butter onto plastic wrap and roll into a log form then chill, or just heap into a bowl and chill. Let sit in the refrigerator for a day for the flavors to blend before using. I'm lazy, I go with the bowl method! Will keep for a few weeks in the refrigerator. This is as easy as it sounds! Start with clean, dry, fresh herbs. Chop herbs and place the chopped herbs in the bottom of a plastic bag. Add just enough olive oil to cover the herbs. Squeeze out the air and seal the bag, then lay the bag flat on it's side. This is very convenient for cooking as your herbs and oil are already combined. Many people like to use ice cube trays to freeze herbs in oil, I prefer plastic baggies. Baggies lay flat and can be stacked so much more oil/herb mix fits in a small space. Plus, cubes are all one size and a frozen layer of oil allows you to take out as much or as little as you need. Simply open the baggie and break off as much as you need for your recipe. When freezing herbs in oil you can freeze single herbs or make herb blends. I had a lot of parsley and basil to preserve so I made a few bags of mixed herbs for spaghetti sauce. Don't forget to label them! Another super simple way to preserve herbs! Simply put diced clean dry herbs (or cut with herb scissors) into a mason jar. Cover herbs with a mild vinegar like white wine vinegar or rice vinegar. Make sure the vinegar covers the herbs by about 1/2". Put the lid on the jar and let stand in cool dry place (like a cabinet) for a week, shaking every day or two. After a week, strain vinegar into a clean jar. Cap and store in a cabinet for up to 6 months. Use on salads and as a marinade. If you need more details on preserving herbs with vinegar check out my recipe for Chive blossom vinegar. While this was a lot of fun I am certainly glad to be out of the kitchen for now. That was a lot of herb preserving! How did you preserve your herbs this year? Want more posts on herb gardening? Click here for my posts on growing herbs. Related reading: There are 11 herbs the can be grown indoors in winter, which ones will you grow? These are all great ways to preserve and use herbs. We dry many of ours as well tonuse instead of buying jar ones. Thanks. Oh, I agree! Freshly preserved herbs are so much better than store bought! I should try to start doing something like this. I like using herbs, but I've never preserved them. I just buy the ones in the jars normally. If you grow herbs you should definitely preserve some of your own. It's super easy to air dry them if you don't have a dehydrator. I've never tried to preserve any of my herbs. I grow a few in my kitchen and my Rosemary bush outdoors stays pretty and green all year long since we had mild winters. I need to try a few of your preserving methods. Ohh, I'm so jealous of your rosemary bush! I have to bring mine in every winter and it just doesn't seem to do great here. I always wanted to grow basil or parsley but have not this year. 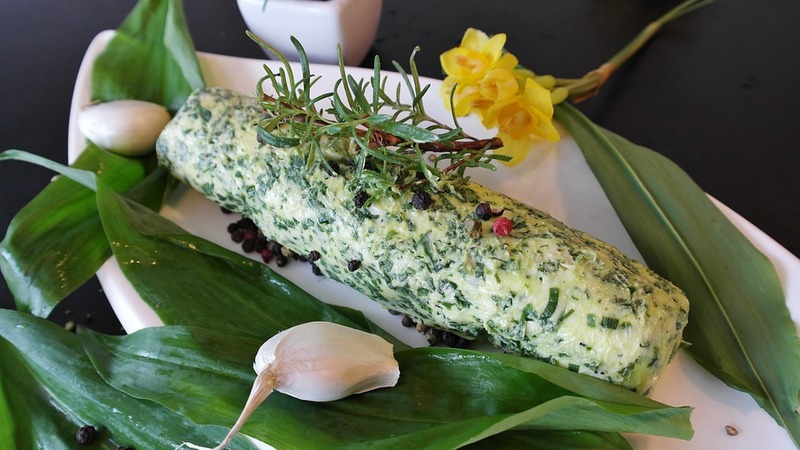 It is great to preserve your herbs and have an oil or a vinagar flavored with herbs. Basil and parsley both grow great in pots indoors, so it's not to late to get started! I think it's a great idea to preserve all the herbs that you can. What are the reasons why I do not grow herbs because they grow faster than what I can eat. This is a great way to do it. Thanks! Some herbs grow much faster than we can eat them too! I never use up all the dill! This is a great way to preserve herbs! I need to look into this, beacause I like to use fresh herbs when cooking! Freezing herbs in oil is probably the easiest herb preservation method, so if you only want to try one method that is the way to go! I have never though of preserving herbs before, but what a great idea! I could definitely see myself giving it a try over the colder months. You should definitely try it! It's super easy and cheaper than buying dried herbs. This is a great post! Thank you! I want to start growing herbs so I'm saving this! I never thought to use sugar for preserving herbs. I do put my parsley and basil in oil. I'm going to dig up some of my mint this weekend and try the sugar method though! Let me know how you like the sugar method! I use the sugar in iced tea all the time...so good! These a re great ideas. THank you. I hate it when I throw away fresh herbs. Now I won't have to! Absolutely! I like preserving herbs so I don't have to buy them year round. It gets expensive! Yes! I preserve more basil than any other herb! It's just so versatile. I love making compound butter. I grow my own herbs in the summer and they make the best seasonings. They really do! Have you ever made a sweet compound butter? I just found a recipe and was thinking of trying it out. Very interesting - I've never made any of these! I do grow a few herbs and it would be fun to try to preserve some of them. The sugared herbs sounds really good! The sugar method is great for lavender, lemon balm, mint and other 'sweet' herbs. You should try it! Preserving herbs from the summer is an incredible way to enjoy herbs all year long without having to buy them. They seem to be even more flavorful too. You're so right! Properly preserved herbs really do seem more flavorful! My sister has made infused oils before. I can't wait to try the salts and vinegar. Awesome. Let me know how you like them! Thanks for these great tips! My husband has been wanting to have a little herb garden, I love the idea of having them year round. You should grow your own herbs! THey're really simple to grow and you'll love having fresh herbs right in your backyard! I will freeze clean and dry herbs. The let them defrost and chop like fresh. Yum. I've never tried just freezing fresh herbs. Do you need to blanch them first? This sounds like such a great idea! I need to start doing this on my own! That is actually a genius idea. Nothing is worse than herbs that don't stay fresh. I just stumbled across your bluff via Pinterest and I have to say-Thank you so much for sharing how you preserve all your fresh herbs! I grew lots of herbs this year but dried them all so I'll definitely be pinning your article for next spring. Awesome! You'll love trying all the different methods of preserving herbs. It's fun experimenting with them!